A few minutes later Peabody came through the door. He was tall where Ragar was short, young where Ragar was old; his head was shaved where Ragar’s was merely balding. “You called, sir?” The tone was deferential, the pose submissive, but there was something in the younger man’s eyes that gave Ragar the distinct impression that far beneath the surface the young man was laughing at him. When Peabody was gone, Ragar pounded his fist against his desk in frustration. He still wanted to break something. Anymore, everything was practically indestructible. And why shouldn’t it be? This was the future, the perfect paradise, Utopia realized, the New Jerusalem descended from the heavens. And no one was happy. Well, no that wasn’t strictly true. There was a manner of happiness to be found. But contentment…that was another bird entirely. The whole world seemed to be caught in the grip of a paralyzing ennui, a specter that lingered like an unseen cloud over the glittering skylines of their peaceful and disease-free cities. And so people distracted themselves. In a world with no dangers to speak of, brats like the Senator’s son paid billions for manufactured conflict, tramping off through warp holes to fight against hoards of zombies. Or, if Peabody had his way, deadly swarms of spiders. It was enough to make Ragar sick. He walked over to where his tablet had fallen, and brushed it off with his sleeve. And then, there on the floor where the cursed thing had fallen, he noticed a single tiny spider skittering across the tile. A grim smile slithered across Ragar’s face. He carefully raised his shoe, and then slammed his heel down with a crunch. Those of you who have read my book, A Prairie Home Apocalypse or: What the Dog Saw may have noticed something strange about the title. You may have noticed that the book itself does not take place on an actual prairie. This is not a mistake. The first part of the title is actually an offhanded allusion to the NPR radio show, A Prairie Home Companion. 2. Wait, Wait, Don’t Eat Me! That’s all I can think of. If you’ve got more leave them in the comments. I’m off into the navy blue and khaki yonder super early today, so I could use a little chuckle. If you cannot think of any jokes then you could always buy my book. That would make me happy too. The zombies are there. The world is overrun by the reanimated dead, walking corpses obsessed with consuming living flesh. Civilization is in ruins. This is widely considered to be a Bad Thing. But hey! There’s always a bright, side right? You know that twenty or thirty pounds you’ve been trying to lose for years? You’ve done all the diets, and you’ve bought all the clothes hanging devices er…I mean exercise machines, but no luck. Well today is your lucky day. You’re going to learn how to lose weight the zombie way. By the time we’re done you’ll be nothing more than a canvass of skin and wiry muscle stretched over harsh protruding bones. Just what you’ve always wanted! In all seriousness though, finding food during the apocalypse is going to be an all-important endeavor. You’re going to have to struggle to scrape together the barest of essentials, all the while trying to stay one step ahead of the corpses that think you would make an excellent meal. Well, yes and no. Canned food is a fine staple to start with but even canned goods won’t last forever. Most have expiration dates between three to five years in the future. Three to five years seems like a long time, and in some ways, it is. But Zombie Tuesdays are about long term survival strategies. It’s fine to rely on canned goods to start with, but you need to have the future in mind at all times. When that food supply finally runs out you’re going to need to have a reliable source of food that will last indefinitely. There are a couple of ways you can do this. First, hunting. Odds are good the zombies will have killed slow-moving livestock like cattle, but animals like deer listen hard and move fast. It’s unlikely that they’ll be wiped out by lumbering moaning zombies. Of course that means they’ll be hard for you to kill too. And if you do kill them there’s the problem of preserving the meat. Drying it won’t work because you’ll have to leave it sitting in one place for a long period and the zombies will likely find it before you can get back to it. Your best option is to salt the meat. Salting draws the moisture out of the cells and helps to preserve the meat for long periods of time. In the days before refrigeration was widely available it was the only way to preserve dead meat. You can forage for plant life to eat. I recommend you get a book called How to Stay Alive in the Woods. It has all kinds of information about what kinds of plants are good to eat as well as tons of other useful survival information. It’s a valuable addition to any zombie survival kit. But if you’re serious about this survival thing, you should think about growing your own food. Gardening won’t be simple in a world overrun by zombies. You always have to remember the first principle we discussed. Keep moving. But you can stop long enough to plant some vegetables along strategic points along your migration route. The best part is you can probably find several abandoned houses with gardens already established. Start there. Keep them fertilized and watered as best you can. Remember how you used to laugh about how ridiculous bottled water was and how stupid it was to pay so much for something you get out of the tap essentially for free? Yeah, well the shoe’s on the other foot now isn’t it? Bottled water may be the only source of clean water the post-apocalyptic world has. Odds are good you’ll be able to scavenge plenty of it from stores and homes, and it’s not like water’s going to go bad, but if you find your supply running low remember to be cautious. Water in rivers and streams is not clean, no matter how clear it looks. It’s infested with all kinds of nasty microbes and other things that want to eat your stomach from the inside. A few drops of bleach per gallon of water should do the trick. Or if you’re a coffee person and you have the time and means, boiling is another great way to kill all those little creepy-crawlies. The bottom line is that survival is the name of the game, and there’s more out there to be worried about then just zombies. Keep yourself fed and hydrated. Try to stay healthy. Remember, dying from malnutrition or drinking germ infested water is still dying. The fate of a new civilization rests on your shoulders. Don’t screw it up. Good news! Through grit, determination, and a whole lot of dumb luck, you have managed to survive the first wave of the zombie apocalypse. You are now alive in a world filled with the rotting corpses of your deceased loved ones, who all want to eat you. Food is in short supply. Civilization is in turmoil. Oh, and you can’t play video games anymore so that’s a bummer. You’re sure you don’t want to just lay down and die? No? Okay then, onward and forward. In last week’s post we talked about the dangers of digging in. No matter how strong your fortress, or how high your walls, eventually staying in one spot will get you killed. Today’s precept for zombie survival: Overkill is Overrated. Regardless of TVTropes‘s opinion on the subject, overkill is dangerous and downright stupid during the zombie apocalypse. This is another thing the movies get wrong all the time. Our heroes are almost always brandishing shotguns and high-powered sniper rifles which they use to splatter the brains of the undead all over the big screen. Um, right…couple of questions here? First of all, you do realize that thing is heavy right? It’s bad enough that you have to keep moving like…forever, but you really want seven pounds of wood and metal hanging off of your shoulder for the rest of your life? I’m sorry, but I assumed you might also be carrying food or water. You know, important stuff. But if all you’ve got is the gun, then by all means, lug it on through the wasteland. Except it isn’t going to do you much good. Why? Because ammo ain’t gonna be in easy supply pardner. We’re talking about the zombie apocalypse here. You think all the other yahoos just laid down quietly and let themselves be bitten? Heck no! They were firing off every round they had into them golldurn zombies. Which means odds are good you’re not going to just find cases of 30.06 shells or 12 gauge buckshot lying around for the taking. And lets say you do find a few rounds here and there. What good are they going to do you? The undead are massing in the millions. How much good do you think that box of twenty rounds is going to do you? And that’s not even mentioning the sound. But sure, go ahead. Satisfy your manly urge to blow that stinking corpse’s head into smithereens. Just know that you’re ringing the dinner bell for all his friends. Okay. Don’t panic. Take a deep breath. There are a couple of good solutions. First, get yourself a .22, preferably a handgun, something you can stick in your pocket. Firstly, because that’s all you need. Think about it. We’re talking about killing dead people here. Of course, there is the slight inconvenience that they’re still up and walking around, but still…dead people. Dead bone decays just as fast as dead flesh. It’s not going to take a lot to punch through those skulls. Second, there’s bound to be a lot more ammunition for it. Most shotgun shells are sold in boxes of fifteen. Most rifle ammo comes in boxes of twenty. Pistol ammo, boxes of fifty or a hundred. But .22 shells? Those suckers come in boxes of five-hundred or more. And they’re tiny. You can easily fit upwards of a hundred in your pocket. The the coup de gras? They’re quiet. Don’t get me wrong, you’ll still have to be careful, but the sound produced by a .22 is nothing compared to what you’re going to get from a shotgun. But even the .22 is problematic. Because eventually you’re still going to run out of ammo. Ultimately anything that requires a renewable fuel source that isn’t naturally occurring is going to drag you down. So what do you do? You say hello…to my little friend. You wanna kill zombies? You really wanna kill all the zombies? I mean, that’s the plan isn’t it? Because, ultimately this is about more than just your survival. It’s about the survival of the human race. Well, you’re gonna have to go melee on those suckers, zombie killing the old-fashioned way, up close and friendly, one customer at a time. An axe, a baseball bat, a well placed brick: almost anything will do. But the weapon pictured above is my personal favourite. 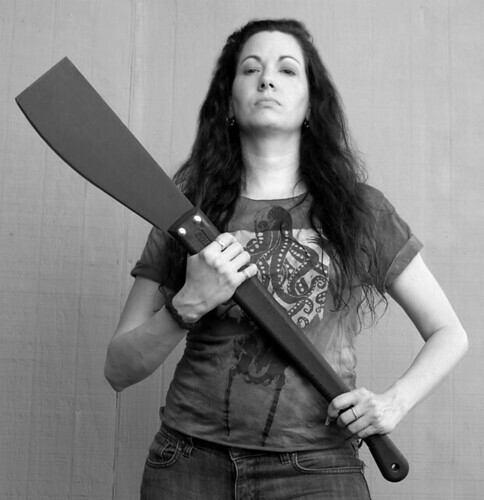 It’s a two-handed machete with a light-weight synthetic handle and a super sharp cold steel blade. It’s sort of a cross between an axe and a machete. I’ve personally held one in my hands, and it’s nothing short of beautiful. This sucker will cut through anything: wood, metal, your sister’s big toe. Anything. It’ll take a zombie’s head clean off in one swipe, and as long as you don’t try to take on too many of them at once it should be more than adequate to protect you from the undead. So put down your shotguns and your sniper rifles. Let go of that grenade launcher. I know it makes you look cool, but let’s face it, there’s no one left to be impressed. You need to get the job done cleanest, safest, most efficient way possible. Do the smart thing. Eschew overkill. Embrace effectiveness. And maybe, just maybe, you’ll make it through alive. Did you just get that little tingle in the back of your head? Did you just think to yourself, “That is the greatest idea ever, of all time”? Apparently the publishers of My Zombie Valentine got that same tingle, and they made it happen. Well, sort of. We’ll get into that later. My Zombie Valentine is a collection of four novellas by four romance authors on the theme of zombie romance. I’m going to give each story its own look, so lets dive right into this thing, shall we? This story was…interesting. It had a lot going for it. I enjoyed the way the author portrayed the world she had created for her characters. Not too much description, just a few offhand details here and there to let us know we’re in a place that is radically different. This is a world were everyone knows about zombies, and invasions from the strange spirit world are taken as a matter of course. But there were some problems. For starters, the story tries to mix slapstick comedy with steamy romance which works about as well as if John Williams had scored the attack on the Death Star with mariachi music. Also the pace of the book is rushed to the point that it becomes difficult to care what is happening. The world the author creates reminded me of some of the more outlandish creations of Jasper Fforde, but it seemed like there wasn’t time to really stop and appreciate any of its bizarre weirdness. I’d very much like to read a longer story set in this world (also, maybe not a romance?) but as it was, I was slightly disappointed with the end result. Also, the main male lead is a zombie that is ultra-perfect physically and needs to drink blood to survive. I’m sorry, but I think you spell that V-A-M-P-I-R-E. This is a story about a voodoo witch who casts a spell to find her true love and accidentally calls forth a zombie. The story revolves around the zombie trying to convince her that he is really the right man for her while she tries to send him back to the grave. I found this story both enjoyable and suspenseful. The author does a great job of telling us what the stakes are. If the female lead doesn’t fall in love with the zombie within three days he will die again, never to return. And even though we know how it’s going to end, she still spins out the suspense beautifully. In addition, this story managed to throw a little humor into the mix without corrupting the overall tone of the narrative, which I rather liked. This was easily my least favourite story in this book. Why? For starters it’s paint-by-the-numbers bland. It’s story about Hollywood that follows stereotypes out the wazoo. The blond actress is a brain-dead bimbo, Hollywood types are only in it for the money, all action movies are mind-numbingly stupid gore-fests…I could go on, but you get the idea. I think the author may have been going for some kind of mockery of the movie making culture she does it so ham-handedly that I find myself wanting to defend them. The romance is pointless and based on nothing but physical attraction (which the story hypocritically derides at another point). Seriously, you it kill you to make your romantic leads into real three-dimensional characters? And here we have the cream of the crop. They saved the best for last, and thank goodness for it. You know what this story has that none of the others did? The thing that made it both engaging and believable? Our two romantic leads spend something like fifteen pages just talking and getting to know each other. You’d think that would make for dull reading, but it’s actually quite enthralling, mostly because it’s clear that the two characters really do have some chemistry between them that goes beyond sexual attraction. The author doesn’t just tell you that they’re falling in love, she actually shows you. Also, this story had the most effective horror out of anything else in this collection, a terrifying “take that” to the cosmetic surgery industry in which women’s breast implants are rejected by their bodies and squeezed out through oozing pustules. You will think twice about cosmetic surgery if you read this story. Overall My Zombie Valentine isn’t a bad book, although I do have a few complaints. First, is it really necessary to have all these characters be unbelievably physically attractive? No, wait I’m sorry. Only the guys have to be perfectly physically attractive. The female leads should be slightly less than perfect so that insecure women can indulge in vicarious wish-fulfillment. Rant much? Why yes, thank you, don’t mind if I do. And while we’re on that subject, why is it that when women objectify men it’s “romance”, but when guys objectify women, now we’re crossing the line buddy. I can’t get away with going into a detailed description of a beautiful woman’s physical attributes without being a perv, but no one bats an eye when a female romance author talks in-depth about what a hunk her male lead is. My final disappointment was that none of these stories contained romances where one of the partners was an actual honest-to-goodness flesh-eating zombie. When you say “zombie romance” I’m expecting a story about a woman who’s trying to cope with the fact that her rotting corpse of a boyfriend wants to eat her brains. I didn’t get anything close to that. So yeah, My Zombie Romance was enjoyable enough. In my opinion it would have fared better if it had focussed more on the zombies and a little less on the romance. Maybe if it had featured a mixture of romance authors and horror authors it could have gotten closer to what it purports to be. Still, it’s a decent read. I picked it up for two dollars out of the remaindered bin at Walmart and I do not feel as if my money was wasted. If you’re into romance or if you’re just intrigued by the quirky concept, I’d say definitely give it a look. Yes, zombies. What is it about zombies anyway? What is there in our cultural DNA that makes us so fascinated with the apocalypse brought on by the walking dead? Have our lives become so easy that we need to dream up horrific images of rotting corpses hunting down the few remaining living, to kick our brains out of their television saturated stupor? Maybe. Who knows? Not me. But they’re coming. You know they are. You’ve seen all the movies and TV shows. You’ve played the games. Maybe you’ve even read the books.You think you’re prepared. You don’t have the first clue how to survive the hoards of the undead. And if you’re not careful you’ll end up in the hoard of undead moaning “Braaaiiiins” and dribbling the guts of your last victim down the front of your “Ask me about my zombie plan” t-shirt. You think that just because you’ve seen every zombie movie ever made, you’re prepared for the apocalypse? Didn’t your mother ever tell you that you can’t believe everything you see on TV? You’re woefully underprepared for what’s coming. That’s why I’m starting a new feature on this blog called, “Zombie Tuesdays.” It would have been alliterated, but some moron forgot to name any weekdays Zedsday, so you’re stuck with this instead. Each week we’ll look at a different aspect of zombie survival and how to avoid being torn apart by the ravenous flesh eaters. It’s human nature. When trouble comes we head for home. If we can’t get home we look for a safe place to hole up in until the problem blows over. You see this in zombie movies all the time. The survivors in the mall, in a boarded up house, in a camp somewhere out in the woods. They’ve dug themselves in, strengthened their fortifications. Maybe they’ve even built a huge fence to keep the undead at bay. Why? Because when you pick a fortification against zombies that place has to last forever. The dead don’t sleep. The dead don’t get tired. And there are far more of them than there are of you. Think you can handle it? Maybe you’ve got three months of canned goods stocked up in the pantry. Maybe you’ve got a well that brings fresh water right into your house. But the food will run out. And the zombies will still be outside moaning and clawing at the walls. Maybe you’re thinking bigger. Maybe you’ve got a whole compound stocked with food and medicine and enough land to produce the food you’ll need all of it conveniently fenced off. But you’re still stuck there forever. Need some medicine from the ruins of the hospital in town? Too bad. Need to scavenge some parts for your generator? Not going to happen. And what are you doing to do when the undead start piling up on top of each other outside your gates until they’ve made a ramp of desiccated flesh that leads right over your precious fortifications? So what do you do? You move. Don’t leave town. That’s another rookie mistake. You get in your car to hit the interstate and you’ll be stuck in a pack of cars full of geniuses that had the exact same idea as you did. And when you run out of gas and the undead are crawling over your car and the sun is literally baking you alive inside maybe you’ll understand why leaving was a bad idea. But you have to keep moving. On foot is fine if that’s all you’ve got. You can easily outwalk the undead, and if any of them get too close you can stop and kill them one at a time. If they’re running then they’re not zombies. This is a zombie survival guide. Again, you’re not going anywhere. You’re not even trying to leave town. Your main objective is to avoid creating a congregation point for the zombies. If you’ve got a bicycle, better still. Bikes are lightweight and can usually be taken places where the roads don’t go. Also, they don’t run out of gas. This is important. If you’re going to survive this you’re going to have to forget about anything that requires any kind of fuel or charge. You’re going to have enough trouble keeping yourself fueled up without having to worry about your car. What about sleep? Well, I would tell you that you could sleep when you’re dead, but that’s not exactly true now is it? This is a long-term plan. You’re going to need to stop from time to time for sleep and rest. Best chance you’ve got is to find a big building with multiple exits. The undead tend not to be the brightest bulbs on the funeral home marquee. If they see you go in one door, they’ll likely begin by crowding around that door. You should have some time to catch a few winks before they call the rest of their buddies and surround the building completely. You can also use this opportunity to do a little looting. But be careful of stores with big plate-glass windows. Zombies will rip through them like a hot chainsaw through butter. When can you stop? You can’t. Not for a very long time anyway. As long as you want to stay alive, you have to keep going. The day you stagnate is the day you die.